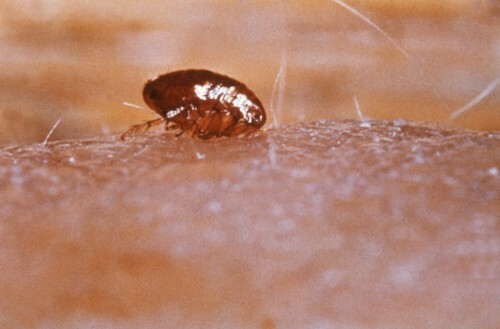 Want to catch living fleas inside your home? It’s not uncommon for researchers to trap living fleas so they can study their behavior and/or anatomy. And with over 2,500 different species of fleas, many homeowners catch them so they can identify exactly which species is infesting their home. Regardless as to why you want catch living fleas, we have a simple technique that works for all species. Most insecticide and flea treatment products are designed to kill fleas, so you’ll want to avoid using these products for the time being. Spraying your home with a chemical-based insecticide may exterminate the flea population before you’re able to capture a living specimen. Hold off on using insecticides and flea treatment products until you’ve caught the specimens. The next leg of the project is to create the flea trap. Pour some room temperature water on a plastic or ceramic plate, add a small amount of dish soap, and place it down on the floor. In order for fleas to be attracted to it, however, you need to place a lamp over it. Assuming the rest of the room is dark — which it should be if you followed the previous steps — the light from the lamp will attract the fleas and draw them to the water-filled plate. When fleas jump on the jump, they will become trapped due to the sticky soapy water. Note: you must add soap to the plate for it to effectively trap fleas. These blood-sucking parasites can jump right out of plain water, but adding a couple drops of soap to it will thicken its consistency so they can’t escape. After setting the trap, leave for the night and check on it again in the morning. If your home is infested with fleas, you should find at least some of them stuck in the soapy plate. Did this method work for you? Let us know in the comments section below!